Here is a list of Best Free GPX Editor Software For Windows. Using these freeware, you can edit GPX files by modifying its metadata, tracks, routes, and waypoints. These let you add new tracks and routes, create routes using waypoints, etc. You can edit a waypoint by modifying related information such as Latitude, Longitude, Altitude, Time, Name, Description, Symbol, etc. These also let you add new waypoint or delete an existing waypoint. Additionally, many of these GPX file editors let you reverse track, restructure track, find duplicate points, batch replace field value, merge all tracks, remove empty tracks, create route from waypoints, shift altitude, anonymize time, etc. etc. Almost all these provide map view to visualize the track on different maps such as such as OpenStreetMap, OpenCycleMap, HikeBikeMap, MapQuest (Satellite), etc. Some handy tools like filter points, copy point information, batch geocoding, etc. are provided in a few of these. Other than GPX, these GPX editor software also support KML, NMEA, TCX, ASC, etc. files. From this list, I liked GPX Editor and Viking the most. These are easy to use software with a nice set of features to edit GPX files. For example, merge all tracks, create route from waypoints, add layers, geotag picture using waypoints, etc. You may also like some best free GIS Software, Geotagging Software, and Picture Location Finder Software for Windows. GPX Editor is a free, open source GPX file editor for Windows. You can simply open a GPX file and edit its waypoints, tracks, routes, and metadata. Not just GPX, it also supports KML, NMEA, NGT, and LOG files to import and edit. As you open a GPX file, you can view and browse its components like Metadata, Tracks, Waypoints, and Routes at left panel. It displays the GPX file in three different modes: Preview, Point List (all waypoints with respective information), and Google Map. You can make modifications to GPX file in Point List and Google Map modes. To edit a waypoint, double click it. You can then modify its Latitude, Longitude, Altitude, Time, Name, Description, Symbol, etc. You can also edit advanced information such as Source, Link, Satellites, Fix, HDOP, VDOP, PDOP, etc. I didn’t find an option to add a new waypoint, but you can duplicate a specific waypoint and edit to create a new one. You can also delete an existing waypoint. Apart from that, you get other editing options like Cut Track, Merge All Tracks, Remove Empty Tracks, Create route from waypoints, Shift altitude, Anonymize time, etc. Additionally, you can reverse points, remove duplicate points, move a track segment to a new track, etc. It lets you import KML, NMEA, LOG, and NGT file to current GPX files too. You can simply save the GPX file after editing it. Or, you can even export it in KML, CSV, or HTML format. It is a portable GPX editor which needs no installation and can be run when needed. GPS Track Editor, as the name suggests, is a free software to edit GPX files containing tracks. Other than GPX, it supports other track files such as TCX, NMEA, Magellan SD, etc. Its main interface is divided into three sections: File, Map, and Points panels. Points are displayed with respective information including Coordinates, Elevation, Date/time, Leg Length, Speed, Heading, etc. To edit a point, select it and then modify its properties including Main (Coordinates, Elevation, Time, etc. ), Calculated (Distance from start, Speed, Acceleration, Heading), GPS (GPS speed, GPS heading, HDOP, VDOP, PDOP, Satellites in view, Fix type), and Sensors (Heartrate, Cadence, Temperature). Apart from modifying waypoints, you can add a break at a particular point. It also lets you delete and remove or restore points. And, it also lets you reverse track, increase frequency, shift time, etc. You can view points by adding a filter by value or local inconsistencies, restore filtered points, or delete filtered points. To view the map, you can choose OpenStreetMap, OpenCycleMap, or MapQuest service. Additional options like unit preference, time zone, etc. can also be used. Apart from saving changes in GPX file, it also lets you export edited GPX track file as NMEA, CSV, or image file. GPS Track Editor is a simple yet effective GPX file editor. I liked its simplistic and intuitive GUI. Extra POI Editor is a nice, easy to use GPX editor for Windows. It has a tiled interface which shows points, preview, map, and more information. After opening a GPX file, you can simply edit it by modifying an existing POI or adding a new one. To add or edit a POI or waypoint, you can insert its detailed information such as coordinates, elevation, time, contact information, display preferences, tour guide information, etc. Other than that, you can also delete a point. It provides a Merge Open option which lets you merge two or more GPX files into one. You can also batch replace a value for a particular field in all waypoints. It lets you find duplicates or POI on routes. You can sort waypoints by name, city, location, state, best route, or category. You can select a map application among GoogleEarth, MapSource, and BaseCamp to view the track. Some additional tools like Batch Geocoding, Batch Reverse Geocoding, etc. are also provided in it. You can view all POIs on the map or you can even open a street map view. Apart from GPX, it supports multiple export formats including KML, CSV, XLS, GPI, etc. You can export the file by category, symbol, state, country, etc. Other than above features, few basic options like copy POI information, copy POI as URL, etc. are available in it. Viking is another free, open source GPX editor software for Windows. You can edit GPX files by modifying routes, waypoints, and tracks. It lets you edit waypoint properties, add new points, create new routes and tracks, delete existing points, and more. It provides a Layers menu too using which you can add new Aggregate, Trackwaypoint, Coordinate, GeoRef Map, GPS, Map, and DEM layers. Apart from that, it provides various view modes and navigation options. This GPX file editor provides an interesting feature to geotag a picture using a waypoint. Just right click a waypoint, select Geotag Images option, add multiple JPG images, and click Ok.
To save edited GPX file, you need to use Export option from File menu. It also supports KML format. Also, you can generate an image file or print the map view. All in all, its a nice GPX editor with some unique functionalities. Garmin BaseCamp is quite a popular GIS software for Windows and Mac. You can also use it to edit GPX files. Just import a GPX file to this software and you will be able to view related data. You can edit a waypoint, track, or route by double clicking it. You can edit general properties like name, coordinates, elevation, depth, symbol, proximity, temperature, contact information, etc. It also lets you add or edit notes (file link, web link), categories, and references related to a waypoint. To add a new waypoint, go to Tools menu. You can locate a new point on the map and then add above mentioned information. You can also delete an existing waypoint. From Tools menu, you can also create new routes and tracks. Also, select multiple waypoints to create a route using them. You can also create a new GPX file by creating waypoints, tracks, and routes. It lets you view a particular waypoint on the map. It supports other formats like KML, KMZ, LOC, TCX, etc. too. It is a feature rich GPX editor in this list. Some additional tools of this software include Send File to Device, Find Points of Interest, Trip Planner, etc. You can learn more about its features from its official website. JGPSTrackEdit is a free, portable GPX editor for Windows. It lets you edit Garmin GPX Track files. For editing, it supports more file formats including KML, ASC, etc. When you open a GPX file, its basic information, graph, and waypoints are displayed on the main interface. Also, the track is shown on the map. It lets you add a new track manually or using graph. And, you can edit a waypoint by modifying its Latitude, Longitude, Elevation, Length, and Timestamp. You can also move, delete, or insert a waypoint. Additionally, it lets you reverse, split, or merge tracks, compress, correct, or remove invalid points, and do more. You can edit points in Append Mode or Append Routing Mode. It provides various view modes and options. For example, Point Information, Distance Measurement, Show Track Length, Show Tiles, etc. It also lets you select a map to view the track such as OpenStreetMap, OpenCycleMap, HikeBikeMap, MapQuest (Satellite), etc. After making all modification to the GPX file, you can save it in its original format or any other supported format. Also, it lets you save map view and altitude profile as images (PNG). GpsPrune is another alternative to software to edit GPX files. As you open a GPX file, its waypoints are listed at left panel. It also displays waypoints on the map on main interface. To edit a point, simply select it and go to Point menu > Edit Point option. You can now edit general data related to a waypoint including coordinates, altitude, name, time, segment, description, and type. To view or edit GPX data, you can change coordinate format and distance unit. Other than that, you can add new points, delete points, duplicate points, rearrange waypoints, etc. Some other features provided in this GPX file editor include Compress Track, Sew Track Segments Together, etc. It lets you save edited file in its original GPX format or export it as KML, POV, SVG, Text, or Image file. GpsPrune is a portable GPX file editor. It can also be used to find picture location. To know more, check here > Picture Location Finder. 3D Route Builder is the next GPX editor for Windows. To start editing a GPX file, enable edit mode from Route menu. It displays point list on its interface from where you can edit waypoints. General information like coordinates, altitude, distance, gradient, time, etc. can be edited. You can manually insert a new waypoint or delete one from the GPX file. Or, you can insert a point or interpolated altitude point using a Geo Tool. You can also import a file (KML, GPX, KMZ, etc.) to add a route to current GPX file.It lets you highlight waypoints, view points on the map in Google Earth, replace a point, etc. It is another good option to edit GPX file. You get some interesting features such as Embed Geo Tool, Drive Route in Geo Tool, Show Route and Vehicle in Geo Tool, etc. You can modify an existing waypoint by editing its name and coordinates. New waypoints can be added too. It lets you delete a point from GPX file. You can reverse the track. Using its Editor button, you can add a waypoint using the map. In this Editor window, you get various options like Get Directions, Show entire itinerary, choose a desired map view, etc. At last, you can save the GPX file in its native format or convert it to other formats like KML, RTE, XML, ITF, etc. 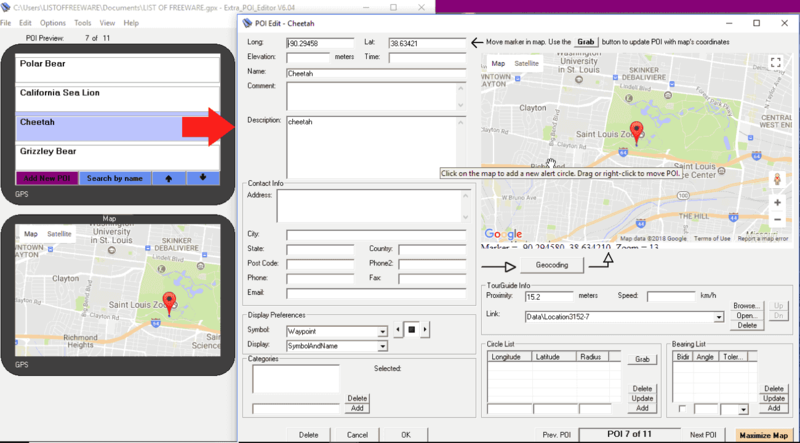 RouteConverter is another one of GPX editor for Windows. Simply open a GPX file and edit its waypoints by modifying information including longitude, latitude, and elevation. You can add a new point, remove a waypoint, and reorder the waypoints. You can sort the waypoints, merge routes from waypoints, import another GPX file to current one, etc. The edited version can be saved in GPX format itself or any other supported format such as TRK, CSV, KML, RTE, LOG, ASC, etc. It is another portable GPX editor in this list. 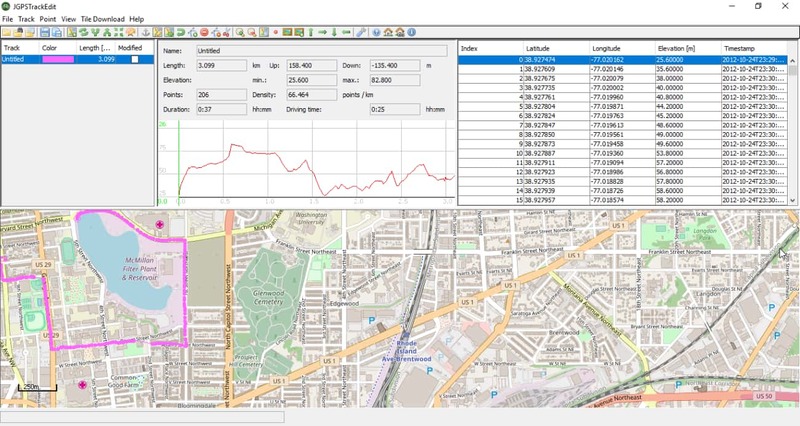 GPS Utility is the next software in this list of GPX editor software for Windows. It lets you edit GPS information in various formats including GPX, such as NMEA, TRK, MPS, MMO, PTF, XML, etc. When you open a GPX file, you can view contained points on the interface. From the interface itself, you can edit information like coordinates, comments, proximity, symbol, etc. Other than that, you insert a new waypoint or delete an existing one. Some other tools offered by it include Break/Join Track, Calibrate Altitude/Depth, Smooth Altitude, etc. If you want to create a new GPX file, you can do that too. Just insert waypoints and add respective GPS information. It also provides a Merge option to merge two or more GPX files. EasyGPS is basically a software to upload and download waypoint, routes, etc. between PC and Garmin, Magellan, or Lowrance GPS. You can also edit existing GPX files in it. As you import a GPX file, its information like waypoints, tracks, routes, etc. and a map plot is visible on the interface. You can easily edit any of the components by clicking it. You can edit existing waypoints, add new waypoints, create routes and tracks, delete a component, set active point, etc. In a similar manner, you can create a new GPX file. It is another nice software to edit GPX files. It has a multitab interface which lets you edit multiple GPX files in different tabs simultaneously. Notepad++ is a popular code editing application for Windows. If you know basic XML coding, you can easily edit a GPX file in it. Open a GPX file and it will show its data as XML codes. You can find a waypoint with its name and manually edit its related data such as longitude, altitude, timestamp, description, etc. In a similar manner, you can add a new waypoint too. To save the edited file, export it with GPX extension. GPS TrackMaker is a free software to create and edit GPX files. To edit a GPX file, open it and you will see its tracks, routes, and waypoints. Simply select a waypoint and right click it to edit its properties such as name, coordinates, symbol, etc. You can also insert a new track or route after drawing new waypoints. It lets you insert map image into a GPX file. Apart from GPX, it supports GTM, MAP, KML, etc. file formats too.